Here is a photo of Margaret Lloyd's (1942 - 1999) first Anglo Arab mare that she bred from Sidi Bou Sbeyel out of her TB retired racehorse Ona Dollar. 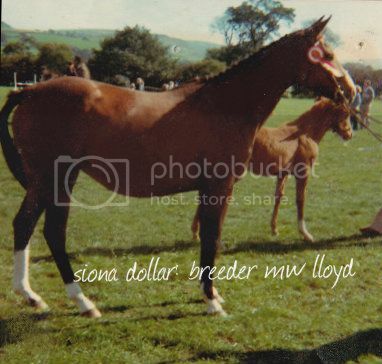 Siona Dollar (b.1974)was a 50:50 Anglo and Margaret generally focused on TB bloodlines to create her stamp of Anglo when selecting stallions for her mare. Although the original foundation mare is TB, for the purposes of this forum Siona is considered her home-bred foundation mare. Siona was half sister to leading 1980s Anglo Arab racehorse (and former county standard Show Hack) El Trapero and dam of various performance Anglo Arabs including, amongst others, Upton Dollar Hills (pictured as a foal in this photo)and El Prendero. Siona was related to Shomran a leading pure-bred Arab racehorse during 1980s. She was a lovely mare who I rode a few times as a young child when Margaret was race exercising riding and leading one. Siona felt like she floated on air, very calm and trustworthy. Her offspring generally felt like 'space hoppers' when you rode them. Margaret's bloodlines return to Siona Dollar and it shows the importance of getting the right foundation mare to support subsequent generations. Margaret focused on reducing the flashyness of Siona with traditional type TBs. El Sabio(GB endurance Anglo Arab) is sired by one of Siona Dollar's offspring. Has anyone else got any foundation mare photos and information? It is interesting to see where generations of bloodlines develop from.